AMSTERDAM, Netherlands, Dec. 9, 2009 -- Northrop Grumman Corporation's (NYSE:NOC) Jim Culmo, vice president of Airborne Early Warning & Battle Management Command and Control Programs, said today that the company's E-2D Advanced Hawkeye Program is on track for initial operational test and evaluation in 2011. Culmo provided a program overview at the Airborne Early Warning and Battle Management 2009 Conference in Amsterdam. "The E-2D System Development and Demonstration (SDD) Program is going very well," said Culmo. "We've successfully completed 94 percent of the SDD Program, and flight tests to date have produced excellent results. We have a strong Advanced Hawkeye Team, dedicated to ensuring that we continue to meet, or exceed, all major program milestones and performance criteria." Culmo noted that the company is on-track to deliver three pilot production E-2Ds to the U.S. Navy in 2010 and that manufacturing of the first two Low-Rate Initial Production aircraft is also progressing well. "We're exceedingly pleased with where we are in the flight test program," said U.S. Navy Capt. Shane Gahagan, Hawkeye Greyhound program manager. 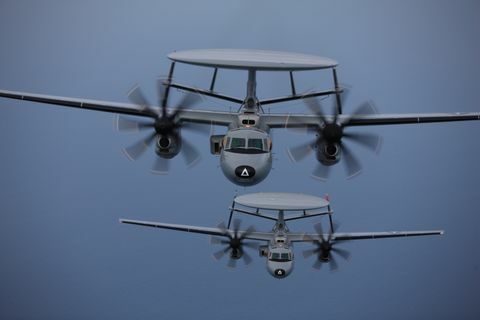 "The AN/APY-9 radar is performing very well and will bring to the fleet a significantly increased ability to operate in a highly cluttered environment while providing critical 360-degree coverage." The E-2D was designed to provide the warfighter with the enhanced capabilities required to meet emerging threats and improved mission effectiveness. With its newly developed AN/APY-9 Electronic Scan Array (ESA) radar, Cooperative Engagement Capability (CEC) system, Electronic Support Measures (ESM), and off-board sensors, in concert with surface combatants equipped with the Aegis combat system, the E-2D will have the capability to detect, track, and defeat cruise missile threats at extended ranges. It will also provide unparalleled maritime domain awareness including airspace control for manned and unmanned assets, monitoring of surface movements, civil support, and command and control of tactical forces. The combined radar modes work together to provide continuous, 360-degree air and surface scanning capability, allowing flight operators to focus the radar on select areas of interest. "The AN/APY-9 can 'see' smaller targets and more of them at a greater range than currently fielded radar systems," Culmo said. He added that the E-2D's systems, including radar long-range detection, "are exceeding key performance specifications."